Send "love hugs" from Beary to your sweetheart. Comes with a bottle of dazzling La Rive Hunting for Men EDT 75ml. A refreshing, sweet fruity fragrance, designed for freedom-loving individualists. Top notes composes of Citruses while Middle notes composes of ginger and coriander leaf and Base notes of Cedar. La Rive's Hunting Man EDT 75ml is perfect for the discerning man who treasures freedom and style. 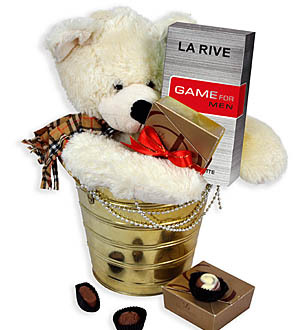 Nothing is sweeter than a seductive fruity fragrant from La Rive (Poland) with luscious Decadence Praline. Next day delivery applicable for Klang Valley only. For out of Klang Valley, kindly allow 3-5 working days delivery. For more information, call 03-78830233 / 012-6915200 or email sales@gift-lab.com.